and rules only pertain to other people! "Art and creating something completely unique gives me immense satisfaction and pleasure, I hope you enjoy it too!" Working as a professional photographer was great, but I began to feel constrained by the limits of expressing myself through the camera lens. Always experimenting outside of photography with water colour, pottery, sculpture and stone carving to name a few, it wasn't until I started painting and exploring colour through abstract art that I found complete creative satisfaction. Largely self taught, I work in quality acrylics, usually on large stretched canvas, and sometimes wood bases. 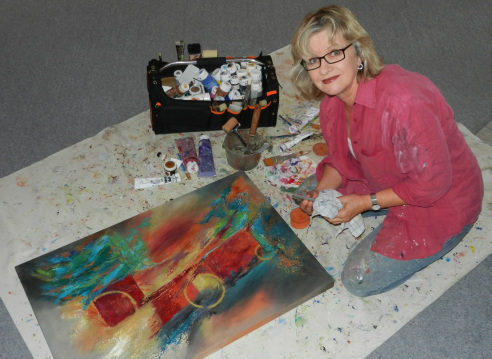 I am passionate about each art work and enjoy creating colour, line, shape and texture individual to each piece. however, if you would like to give one a home I'd love to hear from you! Don't worry about Eddie go check out the artwork on the gallery pages!